Spring has sprung (or at least is trying!). Do you smell new grass and flowers growing or sneezing too much with allergies? Spring’s arrival means more than warmer and longer days. It can impact our memories. A sunny spring day can improve our mood, motivation and memories. We smell the cut grass, the flowers budding and feel the warm breeze. We fire up the grill, taste different foods and change our habits of exercising. Spring’s impact on our senses is an example of how using our senses can assist our memories. Paying attention to and utilizing all our senses can help us create moments from today as well as recall those we have stored away. Imagine a perfect spring or summer day from your childhood…what do you remember? Something you saw, felt, tasted, touched or smelled? This recreation of sensory stimuli can bring us immediately back to a memory. When we truly pay attention using all of our senses we create lasting memories. These sense triggers can then help us recall those moments. Science recognizes that our senses play an important role in memory formation. Use your nose, ears, eyes, taste and touch to create and recall memories. Whether it’s a song, a taste, a smell or a vision, we can use our senses to assist our memories. 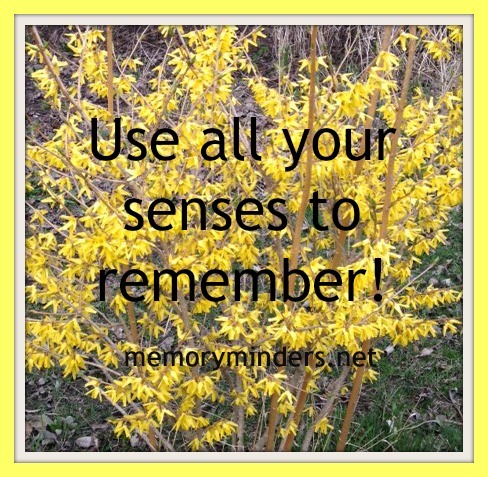 Try it-pay close attention to all the “sense” stimuli around you today and make some memorable moments!